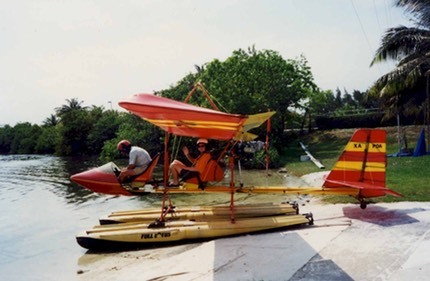 A couple of things you must do if you go to Cancun, visit Chichen Itza and take a microlight ride around Cancun. Both sensational. 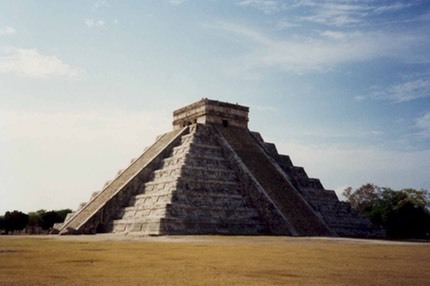 We spent a week touring, seeing Tulum, Coba, Chichen Itza and Uxmal which were all worth it. Merida is good to spend a couple of days in too, there are lots of markets and you can buy a beetle (live) on a chain with a jewel glued to its back to wear as a brooch. If you're in downtown Cancun check-out La Habituella (get an outside table). We had a cracking guide and also the most irritating tourist in our group. She had a camera with a huge lens and never seemed to sleep. I set my alarm for an early morning birdwatch and there she was!. Every time the guide showed us anything she was already in the way taking pictures. After a couple of days it went something like this. Guide (with sarcasm) - nice camera! Met a great couple on tour (Elaine and Mark). We spent a colossal evening in Cancun drinking yards of lager followed by yards of margarita followed by yards of hangover. Chitchen Itza is probably the most spectacular architectural site we have been to. Stay overnight to beat the day-trippers. Its the only way you'll get this photo with no people in it. The ball court and the astronomic dome are both good as well. A half hour flight in one of these is a great way to see Cancun, but not for the nervous. Advertising slogan "maintained by Americans". 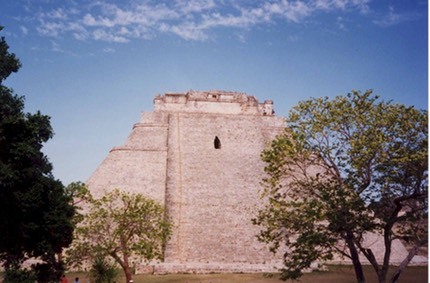 Uxmal is, I think, the tallest Mayan ruin in Mexico, and quite tough to climb. The small entrance you can see goes into a small temple where some bats hang out. 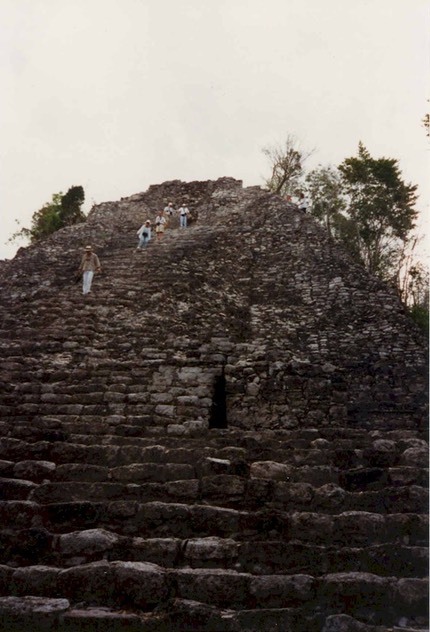 Coba, fairly newly opened up and not restored. Some great bird-watching in the jungle here and many other ruins yet to be unearthed. Experienced a tropical storm here which lasted about half an hour, but the resultant preening of the parrots was worth the wet clothes. Mexico second time round was the end of our massive world trip. We spend a couple of weeks in Mexico City and up in the north at the superb Copper Canyon in August 2003, before leaving to head for Panama. We found Mexico much more expensive than our first visit so decided not to spend as long here as originally planned. Mexico City is fantastic and we really enjoyed visiting the nearby ruins, the sites in Mexico City itself and the archeological museum. To get to the Copper Canyon we went on the Pacific Chihuahua train ride which was stunning in terms of scenery, railway engineering and lateness. (2.5 hours). We came back into Mexico from Guatemala and a dodgy border crossing to visit ruins at Palenque and Oaxaca before hitting the beach at Puerto Escondido. Jonna went to Acapulco to meet friends whilst I toured a bit more before joining her there to see the famous cliff divers. From Acapulco we headed via Mexico City where one of our bags got stolen to San Christobal and onto Playa del Carmen for some seaside action and more diving. A final sprint across the gulf coast via Villahermosa, Vera Cruz and Papantla took us back to Mexico City for the horrifying prospect of a flight home.Mexico City is a fantastically vibrant and fun place, much maligned, probably by people who have never been there. 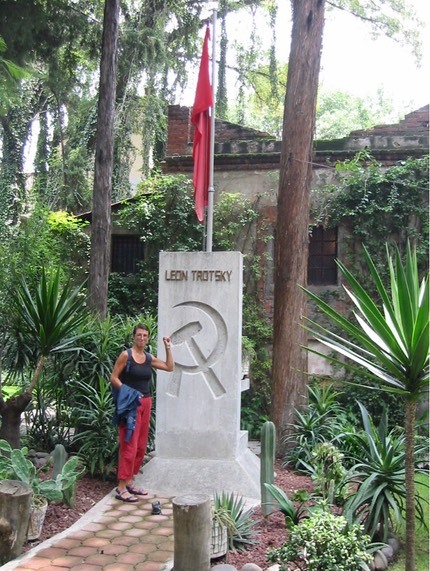 Within the city there is so much to see from ancient ruins, through churches and colonial buildings to such great sites as Trotsky's house. Good hotel rooms can be found for $30 and market foodstalls serve up great Mexican snacks. 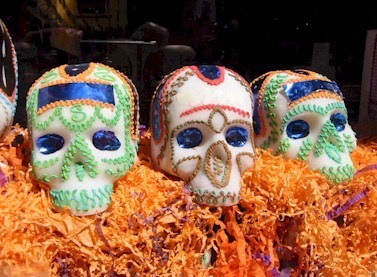 Mexicans are obsessed with death and eating so manage to combine these in their day of the dead festival where lots of ghoulish sweets and cakes are sold. The main square (Zocalo) is transformed into a massive graveyard. 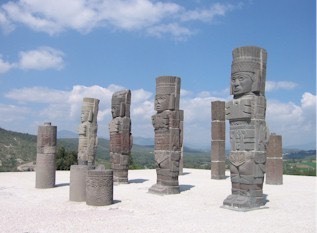 Close to Mexico City are two great sites. 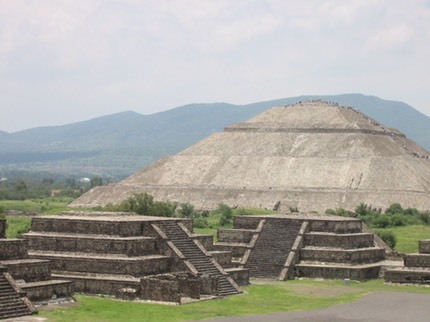 Teotihuacan is the most famous where giant pyramids were found and restored along with dozens of smaller buildings. 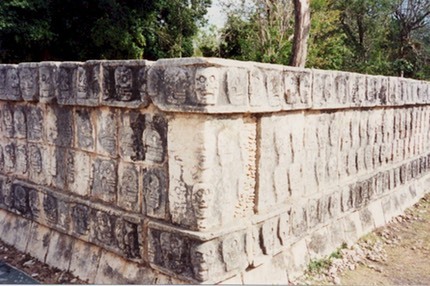 This picture shows Tula, north of the city where these huge statues were erected on a tall pyramid. There are also 2 giant ball courts here. Trotsky spent the end of his life living here in a posh suburb surrounded by servants continuing to postulate on communism. The bullet holes are still in the wall from an earlier attempt to kill him (honestly, this weekend luv!) before he got the ice-pick that made his ears burn. His remains are in this stupa. Playa del Carmen was where we chose to spend 2 weeks at the end of the holiday winding down. It offers diving in the sea and also in freshwater cave systems called cenotes which we did. Superb and really eerie as you dive with torches in darkness and see fossils, stalagmites and stalagtites all under water. Cool. There was a lot of competition on the beach for punters so it was easy to get free deck-beds and buckets of beer cheaply. Lots of people moan about these types of resorts being too commercial but we have to say this kind of pandering and proliferation of restaurants and shops beats those 'charming' places like Puerto Escondido which we thought was a dull dump.